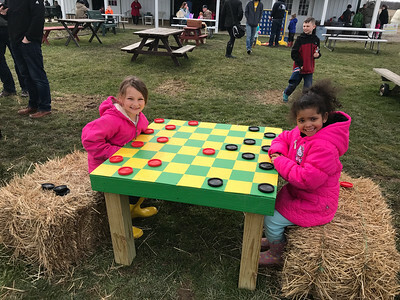 NATHAN HAVENNER / GAZETTE Taylor, 8, left, and London Popil, 5, of Medina, play a game of giant checkers at Beriswill Farms, 2200 Station Road, Liverpool Township, on Saturday during the Easter Egg Hunt and Farm Fun event. 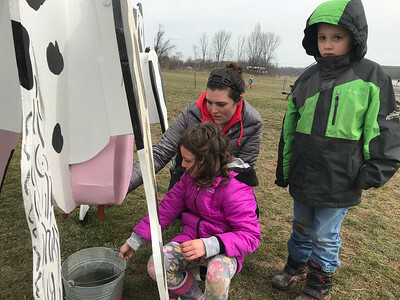 NATHAN HAVENNER / GAZETTE Madelyn Aliff, 8, Eli Sawyer, 6, and Ashley Blagg of North Ridgeville check out a wooden cow that teaches kids how cows are milked during the Easter Egg Hunt and Farm Fun event at Beriswill Farms, 2200 Station Road, Liverpool Township. 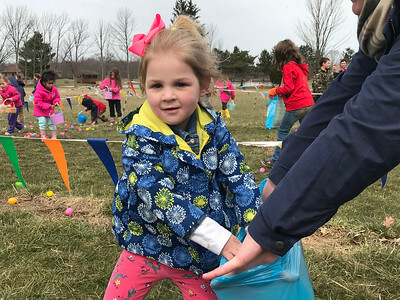 NATHAN HAVENNER / GAZETTE Kids line up for an Easter egg hunt Saturday at Beriswill Farms, 2200 Station Road, Liverpool Township. NATHAN HAVENNER / GAZETTE Kennedy Boyer, 3, goes for an Easter egg during an afternoon hunt at Beriswill Farms on Saturday. 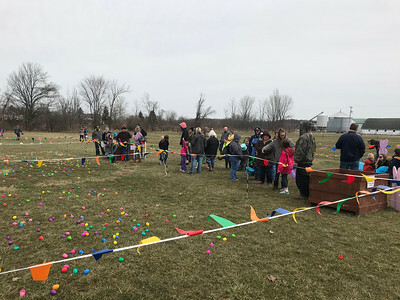 The farm at 2200 Station Road, Liverpool Township, has hosted the Easter Egg Hunt and Farm Fun event for families since 2016. Taylor, 8, left, and London Popil, 5, of Medina, play a game of giant checkers at Beriswill Farms, 2200 Station Road, Liverpool Township, on Saturday during the Easter Egg Hunt and Farm Fun event.